Complementing the New Year’s Eve Te Deum, there is also a tradition of praying the hymn Veni, Creator Spiritus on New Year’s Day. Composed in the 9th century, this hymn is traditionally used at the opening Church councils and papal conclaves. It is often heard at the start of important undertakings, such as the beginning of a school year. The Church likewise offers a plenary indulgence to all who participate in its public recitation on New Year’s Day. Devotion to the Holy Spirit was a strong element of Servant of God Isaac Hecker’s spiritual life. 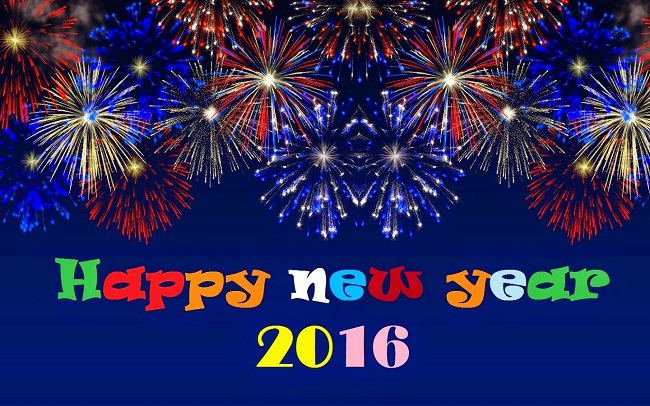 May we all pray earnestly for the gifts and guidance of the Holy Spirit on our world as we look ahead to 2016! Looking ahead to 2016, I am looking forward to turning 68 in March! Truly "time and tide wait for no man"! And, like so many others, I am eagerly looking forward to the sixth (and, sadly, final) season of Downton Abbey, which having finished in the UK on Christmas is now ready to start in the US this Sunday. TV series sometimes have trouble sustaining sufficient momentum season after season. Some series have a fantastic first season and then slowly go down in subsequent seasons. Downton Abbey has not followed that trajectory and has instead turned in a top-quality performance over and over again for five years running now. I hope this season will be of similar quality. I hope also that we will see these characters, to whom we have gotten so attached, each come to a suitable resolution of his or her journey. And, please, stop the sadistic persecution of Bates and Anna, and allow them some well deserved modicum of happiness in their lives! The 2016 Presidential campaign will finally reach the point at which such campaigns used to start, and will begin the actual voting stage with the Iowa Caucuses and the New Hampshire Primary. What effect will actual votes have? My political scientist hat tells me that all bets are off this year and that everything political analysis has assumed based on previous election cycles is up for grabs this time around. Still the likely outcome of it all may be the expected election of the first female president and the oldest president - an important identity-group box to check for two rather large constituencies! Pope Francis will visit Mexico in February. That visit will presumably include a Mass at the border - something many had hoped would have been part of his US trip last fall. A papal visit to the border would be a nice counter-message to the vicious campaign currently being waged within one of our political parties and also perhaps a much needed wake-up call to certain segments of the American Church about with whom the future of the Catholic Church in America actually lies. This summer, the Pope will travel to Krakow, Poland, for World Youth Day. To some, looking at them from the outside those mass gatherings may seem excessive. But, having had the experience of attending WYD in Cologne 10 years ago, I would say that from the inside they are a great opportunity for young people to experience the Church's vitality and universality and to return home energized in their commitment. Hopefuly, WYD 2016 will also produce many, much needed vocations to the priesthood and religious life! Meanwhile the Year of Mercy will taKe up most of the coming year, overlapping with our merciless presidential campaign. May the former have greater influence over the latter! One of the especially attractive features of the Christmas octave is the series of saints whom we are blessed to celebrate during this week - Saint Stephen, the first martyr, Saint John, the beloved disciple, the Holy Innocents, and now today Saint Thomas Becket (1118-1170), Archbishop of Canterbury and one of the great martyrs for the freedom and mission of the Church in the world. Until 1960, the Breviary's second nocturn recounted the famous story of the Archbishop's martyrdom in Canterbury's cathedral. It told how, when the priests tried to protect their Archbishop by barring the cathedral's door, Thomas opened it himself, saying, "The house of God may not be defended like a fortress. I gladly face death for the Church of God." 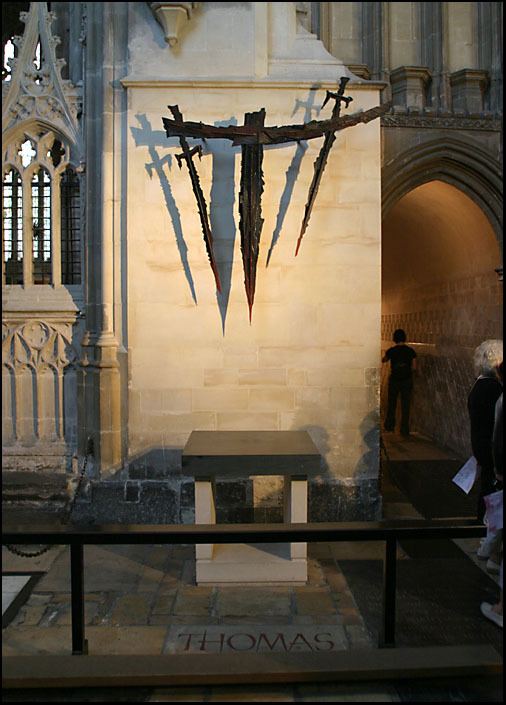 Twenty-three years ago, I celebrated this feast at Canterbury Cathedral, where, after solemn Evensong, the Archbishop of Canterbury himself led us in procession to the site of Becket's death (photo), where the original account of the saint's martyrdom was read aloud. It was a very beautiful and edifying ceremony - as one would expect from the Church of England. But I remember thinking what an irony this all was. There we were celebrating the feast of the great defender of the Church's mission in the world, while the celebrant of the feast was himself Becket's successor but in an office and church polity completely transformed less than four centuries after Becket's death. Henry VIII's reformation rightly recognized the incompatibility between the Church that Becket died for and the Church "by law established" that the Reformation replaced it with. No wonder the Reformation removed Becket's feast from the calendar and destroyed his sumptuous shrine! According to our modern way of thinking, Becket fought and died for the freedom of the Church within civil society. But Becket actually fought and died for the identification of civil society with the Church. It was the King Henry II rather who fought for freedom - the freedom of the State to rule the Church, of politics free from the restraints of religion. Henry II failed, but his later namesake Henry VIII succeeded, and the rest (as the saying goes) is history. Today's society seeks even more complete emancipation from religious restraints, and states continue to seek control over the Church in order to guarantee their total autonomy. Becket's challenge to today's Church is not to abandon the public square in order to carve out privileged exceptions for religious entities, to bar the church doors as if the Church were a fortress to be defended. Becket's challenge to today's Church is rather to open its doors to proclaim its continued presence in the public square - to preach the word, be urgent in season and out of season, convince, rebuke, and exhort, be unfailing in patience and in teaching (2 Timothy 4:2). To paraphrase Queen Elizabeth II's famous 1992 Annus Horribilis speech, 2015 is not a year on which much of the world will "look back with undiluted pleasure." Undoubtedly, the year has had its better moments, which each of us can look back on and cherish. For example, in my own personal life, I had the happy experience of participating in two very positive and fulfilling gatherings, which were distinctive to this year. The first was a community retreat on the Jersey shore in observance of the Year of Consecrated Life. It was well attended by almost the entire order and was widely welcomed and well received - largely, I suspect, because it gave us a chance to focus on how we live as Religious in the Church, rather than focusing as we so often do on the work we do for the Church. The second was my 50th High School Reunion in New York, which was less about the present and the future (as the Jersey gathering was) and more about memories, positive and negative, and bringing appropriate closure to that formative experience we shared back in what now seems like another world, but which was nonetheless so decisive for each of us. But, back to the bigger picture, both national and global, it seems safe to say that 2015 has not been one of human history's better years. I seldom agree with NY Times op-ed columnist Ross Douthat's partisan conclusions, but I frequently find myself agreeing with much of his analysis of where our society has been and where it seems to be headed. In yesterday's NY Times Sunday Review, Douthat persuasively makes the case that something significant has changed in 2015. In his column "Cracks in the Liberal Order," Douthat argues that the hitherto stable-seeming "architecture of liberal modernity" suddenly seems much more vulnerable. The year 2015 has been, he suggests, "a memento mori moment for our institutions - a year of cracks in the system, of crumbling firewalls, of reminders that all orders pass away." Making my own list of such challenging moments of this year, I started with the terrorist events in Paris that bookended the year - the Charlie Hebdo shootings on January 7, followed by the multiple November 13 attacks. Islamic terrorism hit the United States too in San Bernardino, along with the more common gun violence that is killing our country and will keep on doing so until the evil of private gun ownership is exorcised from our society (which it surely won't be any time soon.) As Pope Francis said in his New Year's message: "Sadly, war and terrorism, accompanied by kidnapping, ethnic or religious persecution and the misuse of power, marked the past year from start to finish." One catastrophic component of that has been the continued displacement and dislocation of so many civilians, thanks to the ongoing Syrian civil war (itself one of the many calamitous consequences of that tragically misnamed "Arab Spring" and of the world's disastrous refusal - dramatically demonstrated in the fall of 2013 - to intervene in that war). The photo image of that 3-year old drowned boy became the most famous frame of this very long film of migrants and refugees pushing their way into an indifferent and increasingly unwelcoming West, with a chain of consequences yet to be fully fathomed. Finally, of course, there is our pathetic political campaign, which in almost every way has hit new and newer lows. For decades now, our superficial news media and an uncaring electorate have been turning the political process into some sort of competitive reality show. And now just the right demagogues have come along to manipulate and use that to their advantage, further degrading not just the political process but an entire society. Way back when I was an academic, I theorized how capitalism undermines human solidarity by diminishing our "capacity to care." Pope Francis employs the concept of indifference - referring in his New Year's message "to indifference to one's neighbor and to the environment," which he identifies as "one of the grave consequences of a false humanism and practical materialism allied to relativism and nihilism." In the short-term, of course, Douthat is likely correct that it remains wiser "to bet on the current order ... and against its enemies and rivals and would-be saboteurs." But that turned out to be true as well in 1968, a single year that even more dramatically defined the end of an era. True, at the end of 1968, Humpty Dumpty seemed to have been put back together again with the election of Richard Nixon. But the Nixon years and the decades that followed demonstrated further how fragile and superficial that rebuilt Humpty Dumpty really was. Our institutions and our political culture have proved amazingly resilient these past 50 years as the very fabric of Western civilization and its most fundamental institutions have been attacked and undermined, mostly from within the West itself. But however resilient our institutions and our political culture have been thus far, these repeated blows have done more than merely make a crack or two. We do ourselves no favors by downplaying the enormity of the crisis in which we find ourselves. Nonetheless, the Catholic tradition has long been to give thanks at the end of each passing year and then to turn the calendar's page and invoke the Holy spirit upon the new year. So, later this week, a Look Ahead to 2016. One of the English-speaking world’s more popular modern Christmas traditions is the Service of Nine Lessons and Carols created in 1918 at King’s College, Cambridge. It begins with a single choirboy singing the 1st verse of the 19th century English hymn Once in David’s Royal. The choir and eventually the whole congregation soon join in the singing. One of the verses seems to have been tailor-made for today’s feast of the Holy Family: And through all His wondrous childhood / He would honor and obey, Love and watch the lowly Maiden, / In whose gentle arms He lay: Christian children all must be / Mild, obedient, good as He. Of course, today’s feast of the Holy Family is about more than children being told to obey their parents. Introduced by Pope Leo XIII in 1892, it reflects the modern Church’s concern, in the wake of so much revolutionary social change, to reaffirm the fundamental importance of the family as a natural institution in society and as the unique human community through which society institutionalizes its commitment to the next generation. Addressing that concern is inevitably a critical component of the Church’s social mission in the modern world, one of the reasons why two sessions of the Synod of Bishops, last year and this, were both devoted to the family, specifically to the family’s vocation and mission in the church and in the contemporary world. Like those Old Testament parents Hannah and Elkanah, about whom we heard in today’s 1st reading [1 Samuel 1:20-22, 24-28] , the Gospel [Luke 2:41-52] depicts Jesus, Mary, and Joseph a devout family, faithful to their religious obligations, which include the annual Passover pilgrimage to Jerusalem. So, in the story we just heard, Mary, and Joseph travel to the Temple in Jerusalem for Passover. Jesus is now at an age when he will soon assume his responsibilities and obligations as a member of God’s Chosen People, and so Jesus also accompanies his parents and their extended familial and social network on the pilgrimage. In one sense, this can be thought of as a kind of “vocation” story – Jesus’ first public acknowledgment of who he is and what his mission will be. Already anticipating his later behavior as an adult, Jesus here puts his priority on his relationship with his heavenly Father rather than his earthly family. Hence, his mission is to be in his Father’s house, rather than in the caravan among relatives and acquaintances. Likewise, the wonder experienced by the teachers in the Temple anticipates the wonder which so many will soon experience at Jesus’ teaching during his public life - and the wonder we continue to experience as we experience his continued life among us in his Church. Like Hannah and Elkanah, Mary and Joseph had a son dedicated to the Lord, a son whose mission in life would take him – and his followers – beyond the limits of natural human relationships. We can hear this in the contrasting uses of the word “Father,” first in Mary’s question and then in Jesus’ surprising response. Through the Church, our new relationship with God in Jesus incorporates us into a new network of relationships both wider and more inclusive than any natural human relationships – including even the family. As this year’s Synod said, “Jesus made family relations relative in the context of the Kingdom of God.” Jesus introduced what the Synod called a “revolution in affection,” which represents “a radical call to universal brotherhood” [Synod 2015 Final Report, 41]. At the same time, just like the 12-year old Jesus, we Christians continue to be involved in and dependent upon that natural network of human relationships, of which the family is the first. Hence, “the Church has developed over the centuries a rich teaching on marriage and family” [Synod 2015 Final Report, 42]. Thus, Pope Francis has called the family “the fundamental cell of society, where we learn to live with others despite our differences and to belong to one another; it is also the place where parents pass on the faith to their children” [Evangelii Gaudium, 66]. The reality in our society is increasingly one in which fewer and fewer people feel that they are able to get married and form families. And many who do marry experience that their marriages do not last. There are obviously all sorts of social problems, such as decades of stagnant wages, which contribute to these difficulties. And then there are all sorts of social problems which follow from these difficulties. Obviously, wise public policies are needed to address these problems and their social and economic causes. The Church meanwhile is called upon not only to advocate for such sound public policies but also to accompany families that are stressed in these various ways. The Synod stressed the importance of the parish as a “family of families,” [Synod 2015 Final Report, 77] and the need to “instill in families a sense of belonging to the Church, a sense of ‘we’ in which no member is forgotten” [Synod 2015 Final Report, 90]. The Jerusalem Temple to which Jesus, Mary, and Joseph went on pilgrimage, was the principal and privileged place where one would experience God’s presence among his People. Likewise, what happens here in our uniquely privileged encounter with the Risen Lord in the Eucharist is intended to intrude into and transform everything else and all those day-to-day natural human relationships, including our families. Homily for the Feast of the Holy Family, Immaculate Conception Church, Knoxville, TN, December 27, 2015. Family gets a lot of attention at this time of year. Christmas is increasingly thought of primarily as a family holiday - even in some warped interpretations of the holiday as more of a family holiday than a religious holiday, a day to be spent visiting rather than in church! Still, kept in proportion to the true significance of the feast, the familial dimension of Christmas can be a wonderful thing. Family bonds are fraying in the United States, as the very nature and purpose of the institution is evolving and suffering the fate of so many other communal and social bonds, which just seem to get in the way of the hegemony of the isolated individual. In the words of one of the cousins whose reconnecting inspired the article: "Cousins are important because they share blood, no matter if they are first or distant cousins. Going forward they are legacies of ancestors who set the course for the future and remind us of our perseverance, will, strength, and courage." The challenges facing the family today are many - including, not least, the increasing physical distances between family members. It helps to be reminded that the narrow equation of family with our modern "nuclear family" is just that - modern. It is part of the problem, not part of the solution. In order to be better able to carry out its functions and bear the burden of a hostile culture, family needs to be amplified again to include the wider networks of relationships that defined family in its better days. “Why do we have to do these things?” The Countess’s ironic question came to mind the other day as I was thinking about all the things people nowadays have to do – or think they have to do - for Christmas. Personally, I have always loved Christmas, but I sometimes think that modern life has managed to make Christmas very, very complicated for a lot of people, which may be why so many seem to be more exhausted than exhilarated by all that shopping and visiting and celebrating. Yet, in spite of all that, the basic idea of Christmas is quite simple, which may be why people have usually been so eager to celebrate it, no matter how difficult or challenging the circumstances in which they find themselves. The basic idea of Christmas was simple enough in 1818 in the Austrian village of Oberndorf bei Salzburg, where Father Joseph Mohr was busy doing all the things he had to do to get ready for Christmas in his little parish church of Saint Nicholas, when (so the story goes) he suddenly found himself with without a working organ for Christmas – a stressful situation anywhere, but especially so in that very musical culture. Father Mohr had no choice but to downsize his Christmas expectations. He took out a little Christmas poem he had recently written and brought it to his friend Franz Gruber, who set it to music that anyone could sing. And so we got Silent Night, which has since become perhaps the world’s most famous and favorite Christmas carol. And it only got worse when, having been turned away from the village inn, they had to settle for a stable and a manger for the baby’s birth - like so many migrants and refugees today, turned away from one border or other and forced to fend for themselves. Jesus, Mary, and Joseph soon became political refugees themselves when, like millions of displaced persons today, they were forced to flee through a hostile environment to find shelter in a foreign country. Fortunately for them, Egypt’s border was open, unlike so many borders today. We have no newsreels or YouTube videos from the 1st century to document the Holy Family’s flight from Herod’s terror. But we have more than enough images in today’s world to show us just what their flight must have been like. Herod himself, for all his royal pretensions, was not a member of Israel’s real royal family, the house of David. He was just another minor warlord whose rule was convenient for Roman imperial power, much as tyrannical local warlords rule in many places today because they serve the interests of bigger regional powers. We have images from today’s news to help us picture that first Christmas. But we also have something more. We have the gospel story, the story that tells us not only what happened but why, when God entered this world as one of us – as we say all the time in the Creed, kneeling today to give it added emphasis, for us and for our salvation. But instead, because of Christmas, we now do have an alternative to despair! Hence the angel’s reassuring words to the shepherds: Do not be afraid! We will hear them again at Easter, from the Risen Lord speaking to his disciples, the same Risen Lord who comes to us again and again whenever we celebrate the Eucharist. By the way, next time you watch A Charlie Brown Christmas (which I have watched every year since its debut 50 years ago), be sure to notice how even Linus drops his blanket at the moment when he recites those words, Fear not! Of course, the shepherds at Christmas and the disciples at Easter really were afraid – and for some very good reasons. And for all our happy holiday cheer, so perhaps are we, as we come to the end of another difficult and challenging year and look ahead – with hope, to be sure, but also with anxiety. It’s not for nothing that we pray every day at Mass that we may be safe from all distress, as we await the blessed hope and the coming of our Savior, Jesus Christ. Our distress may be real enough, and our anxiety about it honest, but so must be our hope - the blessed hope and the coming of our Savior, Jesus Christ, who fills us with his grace and mercy and takes away all our fear. That is why we celebrate Jesus’ birth not with a birthday cake but with the Eucharist, the Body and Blood of the Risen Christ. For this is not some nostalgic holiday pageant. And the baby whose birth we celebrate is not just some distantly ancient historical figure, but God-with-us! So, while we may not need to do all the things we do that can make Christmas seem so stressful, we do very much need Christmas! The God who became human in Jesus is inviting us this Christmas to take seriously his coming into our world – as Pope Francis has said, to be “convinced from personal experience that it is not the same thing to have known Jesus as not to have known him.” Taking seriously Christ’s coming into our world means making ours as well the commitment that he himself made when he became one of us in our world on Christmas – in the wonderful words of Charles Wesley’s familiar carol: Peace on earth and mercy mild, God and sinners reconciled. Once again this Christmas, Christ comes into our world bringing his peace and mercy and reconciling us to God and one another. And so he invites us to take seriously his coming into our world - to overcome whatever barriers remain between us, between young and old, rich and poor, healthy and sick, native and immigrant, friend and foe. So every time we come up our hill to this bright and beautiful church to hear this familiar Christmas story, it must really become our story too, challenging us to bring the brightness and beauty we experience in this church with us back down the hill into the streets and neighborhoods, the homes and living rooms of our city, and so to reimagine our world – and, in so doing, to transform our fear into hope, our frustration into fulfillment, our sadness into joy, our hatred into love, our loneliness into community, our rivals and competitors into brothers and sisters, and our inevitable death into eternal life. Christmas Homily, Immaculate Conception Church, Knoxville, TN, December 25, 2015. The older I get the more quickly Christmas seems to come up on me. Or maybe it has nothing to do with age, but with the nature of the things I have to do at this stage of my life, the way certain tasks pile up just before Christmas - including things that have nothing per se to do with Christmas but demand my attention before year's end. Then, on top of that, these past two weeks I've been fighting one of my annual colds, which leaves me feeling weaker, less enthusiastic, and almost abandoned. Of course, ordinary people - or at any rate people in ordinary families - have always found themselves burdened in multiple ways just before Christmas. By comparison, I who have hardly any presents to purchase should hardly complain! But "Keeping Christmas" - to use Dickens' lovely alliteration - is about more than just being ready, having everything done in time: every card written, every gift bought and wrapped, every public place decorated, etc. All of that stuff - wonderful as so much of it is in so many special ways - is just the external accompaniment of our great annual winter holiday, only superficially preparing us for the great feast. What is so problematic about all this, of course, is that it is my job to highlight the essential meaning of Christmas - not just for myself but for everyone else. And how am I supposed to do that well - or even adequately - when my own Advent is as unfocused and unreflective as anyone else's? I had resolved this Advent to re-read Pope Benedict XVI's little book Jesus of Nazareth: The Infancy Narratives (2012), the best, reasonably accessible commentary of which I am aware on the infancy gospels. My hope was that it would add some insight to my preaching on those gospel stories - and maybe more generally some much needed inspiration as well! In the second Preface for Advent, we pray It is by his gift that already we rejoice at the mystery of his Nativity, so that he may find us watchful in prayer and exultant in his praise. The goal of being watchful in prayer and exultant in his praise seems somewhat even more elusive than usual this year. Fortunately, the gift is given anyway, by the grace of which I may yet hope - we may all hope - to rejoice at the mystery of his Nativity! Meanwhile, to whoever reads this post, my best wishes for an abundance of blessings this Christmas and for all of 2016! It’s Gaudete Sunday, the day when the Church dresses herself in cheery-looking rose vestments (in place of penitential purple), the Advent Sunday when we once again hear Saint Paul’s powerful message, which is simultaneously so comforting and so challenging: Rejoice in the Lord always. Your kindness should be known to all. The Lord is near. Have no anxiety at all [Philippians 4:4-6]. It’s nice to be told to rejoice. The lights and sounds of the season, the greetings we get in the mail, not to mention the shopping-inducing messages our commercialized, consumerist culture keeps sending us from every direction, are all telling us to rejoice. But what about the rest of Paul’s message? How about Your kindness should be known to all, and Have no anxiety? Just how are we supposed to do all that? Well there are people to tell us how to do that too, aren’t there? Isn’t that why we have advice columns, website medicine, TV talk shows, psychic hotlines, expensive psychotherapy, personal trainers, “life coaches” and - most ubiquitous of all, at least right now - presidential candidates, that all purport to help us answer that question? And then there is John the Baptist in today’s gospel reading. “What should we do?” The crowds asked John the Baptist [Luke 3:10]. And John, being John, didn’t hesitate to answer – quite directly, giving each group its own targeted tailored to the specific moral challenges connected with each profession. Now John’s people, so the gospel tells us, were filled with expectation [Luke 3:15]. Just what were they expecting? Santa Claus? Not likely! A year-end Christmas bonus? Probably not that either! For that matter - and much more to the point - what are we expecting this Advent, this Christmas? The Lord is near, Saint Paul tells us. It is he whom we are expecting. But then the conclusion Paul draws from that is quite the challenge: Have no anxiety at all. Which leaves us where we started with the question: How do you live without anxiety, with no anxiety at all? How can anyone do that, with all the daily worries that weigh us down, the bills that never stop coming and seem to get bigger all the time, the sense so many people increasingly have (especially in the 30 years or so) that the economic deck is stacked against them, not to mention the big picture problems of the larger world that are anything but faraway - war, terrorism, and climate change, not to mention gun violence in schools, churches, and even workplace holiday parties? The fact that St. Paul made his point with such emphasis, even repeating himself, suggests that such anxiety must have been as real a problem for his 1st-century audience as it is for us, and that they too may have found rejoicing a bit of a challenge. Today, Pope Francis has opened the Jubilee Holy Door at his Roman cathedral church, the Papal Basilica of Saint John Lateran. And all over the world local cathedrals and other designated churches have also opened special “Doors of Mercy,” through which all are invited to go on pilgrimage to celebrate God’s great mercy of which we are both the recipients and his instruments. "This Extraordinary Year," the Holy Father assured the world in his homily at the Mass that preceded the opening of the Holy Door at Saint Peter’s earlier last week, "is itself a gift of grace. To pass through the Holy Door means to rediscover the infinite mercy of the Father who welcomes everyone and goes out personally to encounter each of them. It is he who seeks us! It is he who comes to encounter us! This will be a year in which we grow ever more convinced of God’s mercy." "In passing through the Holy Door, then, may we feel that we ourselves are part of this mystery of love, of tenderness. Let us set aside all fear and dread, for these do not befit men and women who are loved. Instead, let us experience the joy of encountering that grace which transforms all things." This Jubilee Year should remind us that the rejoicing Saint Paul prescribe is not some passing sentiment, not some eggnog-induced holiday cheer, but rather is rooted in the new identity we now have from our experience of God’s mercy. Homily for the 3rd Sunday of Advent, Immaculate Conception Church, Knoxville, TN, December 13, 2015. Understanding U.S. Catholic Sisters Today is the title of a recent report by Kathleen Sprows Cummings for FADICA ("Foundations and Donors Interested in Catholic Activities"), a network of over 50 private foundations and donors committed to supporting Catholic-sponsored programs and institutions. The report has received a lot of attention, in large part because of its attention-getting opening sentence: "today there are approximately the same number of Catholic sisters int he United States as there were a century ago-just under 50, 000." The report also opens by citing a recent study that some 8% of never-married millennial women have considered a religious vocation, of whom 2% have considered it "very seriously." All this is good news, of course - up to a point. It suggests "the crowded novitiates and overflowing convents of the mid-twentieth century represent an anomaly in the history of U.S. women's religious life rather than a standard to which sisters could or should return. this perspective helps to diffuse the pessimism that often surrounds discussions of religious life." On the other hand, as the report recognizes, the fact that there are as many sister snow as a century ago says nothing about that number relative to the size of the American Catholic population (considerably larger now than a century ago) or about the relative median age of sisters (considerably higher now than a century ago). The latter numbers are particularly discouraging: 91% of finally professed sisters were age 60 and over in 2009, and more than two-thirds of men and women religious are older than 65. So, while there is certainly good news, the challenge for the future of viable religious life in the U.S. remains real and pressing. Discussions of the real or imagined decline of religious life in the U.S. tend to be polarized along ideological liens, reflected somewhat (at least to the outside world) in the existence of two apparently competing organizations for women religious in the U.S. and the very visible difference between sisters who look like sisters (i.e., wear habits) and those who don't. the report provides some helpful clarification and nuance to this debate. The broad generalization that younger religious are more likely to prefer the habit and want community life seems to be borne out, but the report also highlights the more problematic side of this, in that those younger religious are also significantly unrepresentative of millennial Catholic, a majority of whom reject several significant Catholic positions. thus the report warns: "If institutes only draw members from a subset-within-a-subset (in other words, the small and atypical minority of the youngest age cohort of U.S. Catholics) future priests and religious may becoming increasingly removed from the beliefs and interests of the majority of their generational cohort—which could make attracting new members even more difficult." With regard to the second, the report notes one in three inquirers into a congregation has a student loan, and the average debt is $26,800. By the time of formal application, the average debt is $21,000. The result: 90% of congregations asked at least one applicant to delay, and 70% turned down at least one person. "Religious congregations do not want candidates’ guilt about burdening a congregation with student loans to dissuade them from pursuing a vocation. At the same time, the institutes do not want to make educational debt a top or even exclusive consideration in debating whether or not to accept a candidate. Yet with other financial responsibilities, such as rising health care costs that are particularly formidable for the already-aging sister population, concern regarding educational debt is an increasingly significant aspect of the discernment process for both the institute and the individual." That we are at least talking about these problems, rather than about not having any applicants at all, is certainly a good sign. But these challenges certainly remain serious obstacles to any hoped-for flourishing of religious life - both men's and women's communities - in the United States in the foreseeable future. On one level, of course, the Trump phenomenon simply represents an apparently more extreme, but logical development of his political party's electoral dilemma. If you are a party whose primary policy purpose is to rig the system to guarantee the continued enrichment of a small economic elite, more or less at the expense of everyone else, you need a strategy - and certain strategic issues - to appeal to others who do not necessarily stand to gain from your party's economic agenda but whose electoral support is essential for your party to achieve power. So you appeal and create an emotional connection on cultural kinds of issues - guns, religion, racism, xenophobia, etc. The Southern Democrats did something similar for nearly a century, using racist appeals and the emotional connection racism generated among whites of all classes to maintain the electoral loyalty of poor white voters - hence keeping the local elite's power secure. For decades, Republican politicians have been appealing to the status insecurities of older, often downward mobile white Americans, many of whom are among the primary losers in our post-modern globalized economy. Racism and xenophobia have always been present in American society, but have been most potent in such periods of economic and cultural change. As the ethnic, racial, and religious composition of American society evolves, and as traditional norms and expectations are being rapidly undermined (more rapidly that perhaps anyone would have expected even 20 years ago), such divisive appeals are ever more effective with certain segments of the population. In the past, political elites could manage such divisive rhetoric and rein it in when it became too threatening to social cohesion. Nowadays, however, such elites exercise less power, for several reasons, in particular the sorting out of the American population into separate ideological tribes with ideology-reinforcing, separate sources of news (and hence separate "facts") and the widespread explosion of divisive, fact-free, rhetoric in talk radio and social media. From flirting with "Birtherism," to demeaning and threatening immigrants, and now singling out Muslims world-wide as objects of hostility, Trumpism has liberated the most dysfunctional aspects of American political culture from the feeble remnants of elite restraints, leaving "establishment" elites looking not only powerless but rather ridiculous. Today, on the solemnity of the Immaculate Conception of the Blessed Virgin Mary, on the 50th anniversary of the close of the Second Vatican council, and on the 1000th day of his own papacy, Pope Francis opened the Holy Door at Saint Peter's Basilica to begin the Extraordinary Jubilee Year of Mercy. "This Extraordinary Year," the Holy father assured the world in his homily at the Mass that preceded the opening of the Holy Door, "is itself a gift of grace. To pass through the Holy Door means to rediscover the infinite mercy of the Father who welcomes everyone and goes out personally to encounter each of them. It is he who seeks us! It is he who comes to encounter us! This will be a year in which we grow ever more convinced of God’s mercy." As was the case 50+ years ago when Saint John XXIII convened the Second Vatican Council, the advent of this Holy Year is overshadowed by any number of prophets of doom who worry whether this is the right time for such an initiative with the civilized world in so much danger from the forces of barbarism. But I remember how the very first month of the Council's deliberations was overshadowed by the greatest crisis of the nuclear age, the Cuban Missile Crisis. That time it was two civilized societies that went to the brink - and brought the world to the brink - of nuclear annihilation. None of that minimizes, of course, the true dangers that beset us or the need for policymakers to take adequate and appropriate action to repel today's threats to civilized life. But it is a reminder of where our priorities need to be and remain. "In passing through the Holy Door," the Pope continued in his homily, "may we feel that we ourselves are part of this mystery of love, of tenderness. Let us set aside all fear and dread, for these do not befit men and women who are loved. Instead, let us experience the joy of encountering that grace which transforms all things." "Before all else, the Council was an encounter. A genuine encounter between the Church and the men and women of our time. An encounter marked by the power of the Spirit, who impelled the Church to emerge from the shoals which for years had kept her self-enclosed so as to set out once again, with enthusiasm, on her missionary journey. It was the resumption of a journey of encountering people where they live: in their cities and homes, in their workplaces. Wherever there are people, the Church is called to reach out to them and to bring the joy of the Gospel, and the mercy and forgiveness of God. After these decades, we again take up this missionary drive with the same power and enthusiasm. The Jubilee challenges us to this openness, and demands that we not neglect the spirit which emerged from Vatican II, the spirit of the Samaritan, as Blessed Paul VI expressed it at the conclusion of the Council. May our passing through the Holy Door today commit us to making our own the mercy of the Good Samaritan." I could hardly help hearing echoes of Isaac Hecker (specifically his famous 1963 sermon, "The Saint of Our Day"), in the Pope reference to "encountering people where they live: in their cities and homes, in their workplaces." Such references remind us of the perennial nature of the Church's internal and external evangelizing mission and of the challenge of encounter. When I last walked through the Holy door at Saint Peter's in November 2000, I hardly ever expected to have such an opportunity again in my lifetime. May we all - individually and as a Church - make the most of it! In 1497, the University of Paris decreed that no one should be admitted to the University without swearing to assert and defend the Immaculate Conception of the Blessed Virgin Mary. Imagine if that rule were still in force! It would certainly be a very different world! 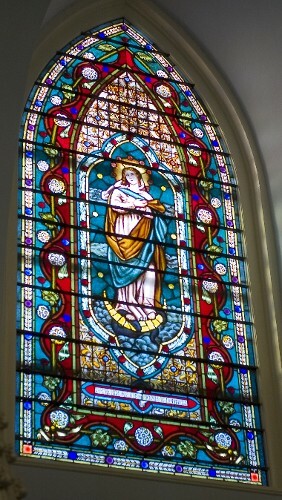 Just 161 years ago, in the year 1854, Blessed Pope Pius IX (who would soon bless Father Isaac Hecker’s project for the founding of the Paulist Fathers) finally defined the heart of the Church’s faith about Mary’s Immaculate Conception – our belief that, thanks to the salvation accomplished by her Son, Mary was preserved from all sin from the very beginning of her earthly existence and thus came into the world completely holy. Just one year later, the small but growing Catholic community in East Tennessee placed their first church and parish here in Knoxville under the heavenly patronage of the Immaculate Conception. And what an amazing 160 years we have had here up on this hill! Anticipating Merton’s hope a century earlier in 1846, the Bishops of the United States had proclaimed Mary the patroness of the United Sates under the title of her Immaculate Conception. So today, already an especially grace-filled day the entire Church, is even more especially so for our country and for our own local parish community. The New Testament does not explicitly speak of the Immaculate Conception. So the Church today focuses our attention on the Annunciation [Luke 1:26-38], one of the most famous scenes in all of human history. The Annunciation was the centerpiece of Mary’s earthly life - from her Immaculate Conception to her Assumption - and the basis for her heavenly life since then as Mother of the Church. At the Annunciation, Mary’s life-long fullness of grace was first formally acknowledged. More importantly, at the Annunciation, her life-long fullness of grace led her to answer “Yes” to God’s great plan to save the world with his mercy. For Mary is the living open door through whom Christ comes into the world so that we may enter into God’s kingdom. In less than 10 hours, Pope Francis will begin an Extraordinary Jubilee Year by opening the Holy Door at Saint Peter’s Basilica, the Holy Door which symbolizes the great open door of God’s mercy. The design of the Holy Door presently in use at Saint Peter’s dates back to the Holy Year of 1950. It consists of sixteen bronze panels. The four panels on the top row depict both the exile of Adam and Eve after the Fall and the Annunciation, when Mary’s “Yes” altered Adam and Eve’s “No” as the default response of the human race’s response to God’s mercy. Every Holy Year is an invitation to go on pilgrimage – to pass as pilgrims through the Holy Doors in Rome and through our local door of Mercy soon to be opened for pilgrims at our own Cathedral Church. That ritual act of pilgrimage symbolizes the movement and direction of a faith-filled life, a life lived in grace-filled response to God’s mercy, as Mary lived every instant of her life from her Immaculate Conception to her Assumption. We must let that image of pilgrimage guide us in our own observance of the Holy Year of Mercy. The Holy Year pilgrimage, Pope Francis has reminded us, “represents the journey each of us makes in this life … by crossing the threshold of the Holy Door, we will find the strength to embrace God’s mercy and dedicate ourselves to being merciful with others as the Father has been with us” [Misericordiae Vultus, 12]. Homily for the Solemnity of the Immaculate Conception on the Eve of the Opening of the Year of Mercy, Immaculate Conception Church, Knoxville, TN, December 7, 2015. It is usually assumed that ancient pagan winter festivities incorporated evergreens and thus represent the remote folkloric origin of our northern European Christmas Tree. Some also see antecedents of the Christmas Tree in the Garden of Eden’s Tree of Knowledge, In medieval mystery plays on Christmas Eve (traditionally also the feast day of Adam and Eve), an evergreen decorated with apples was sometimes used to represent the Tree of Knowledge and its forbidden fruit. From there it may have migrated into the home, where actual apples might be replaced by all sorts of ornaments. And then, of course, the 16th-century founder of German Protestantism, Martin Luther, is commonly credited with having been the one who added lit candles to the Tree. It has even been suggested that well-to-do Protestant families might have adopted the custom as an alternative to the nativity scenes in Roman Catholic homes. But the custom was introduced in Vienna early in the 19th century and soon spread throughout Catholic Austria. Meanwhile, Queen Charlotte (wife of King George III) is credited with introducing the custom in Britain. And then an 1848 woodcut of Queen Victoria and Prince Albert and their children with their Christmas tree at Windsor Castle was adapted in an American publication two years later in what became probably the first widely circulated picture of a Christmas Tree in the U.S. In Sicily, my grandparents certainly never had a Christmas Tree. But, after immigrating to New York after World War I they immediately adopted the prevailing American custom. By my time, the Christmas Tree was the central domestic decoration of the season, although, of course, the traditional presepio continued to retain a place of special honor in our home. Our tree was usually purchased a few days before Christmas. Decorating it took considerable time, typically until sometime on December 24 itself. Also a day or so before, a lit Christmas Tree would be set up above the main door of our parish church across the street from our apartment. Inside the church, however, no trees appeared until Christmas Eve itself, when the sanctuary was transformed into a veritable Christmas forrest. Nowadays, everyone decorates for Christmas much earlier than we used to. So the suspense is gone. The sense of build-up to finishing the job on Christmas Eve is lost. And, of course, at the other end of the process now there are all those already discarded trees to be seen, sadly, in the street on the 2nd Day of Christmas! Still, the Christmas Tree remains enthroned as the central decoration of the season. As we light our tree tonight, we will pray the prayer the Church provides: May this tree, arrayed in splendor, remind us of the life-giving cross of Christ, that we may rejoice in the new life that shines in our hearts. If today were not a Sunday, we would be celebrating one of the Church’s most popular saints, Saint Nicholas, the 4th-century Greek Bishop of Myra, in what is today Turkey. Nicholas lived from 270 to 343 and became known and celebrated for his generosity. In some parts of Europe, Saint Nicholas still comes to bring gifts on the eve of his feast day – as, 34 years ago, he did for us novices at the Paulist Novitiate in Oak Ridge, NJ. Nowadays, in much of the United States, Santa Claus has already arrived in a multitude of Thanksgiving and Christmas parades, but we must still wait patiently another few weeks for his presents. Of course, Santa Claus isn’t the only figure whose annual appearance heralds the coming of Christmas. As she always does on this 2nd Sunday of Advent, the Church today introduces us to the mysterious figure of John the Baptist, who comes out of the desert each Advent proclaiming: “Prepare the way of the Lord” [Luke 3:1-6] . John’s message may be timeless, but Luke the Gospel writer went to great length to pinpoint precisely when in historical time John made his first appearance to announce the arrival of the salvation of God. What one notices immediately is the special solemnity of the story's language - the style of an official imperial proclamation, complete with the names of the reigning emperor and his representatives. That's Luke the historian, telling us who, what, when, and where - situating John's message in the larger sweep of human history. The point is that, while the message itself may indeed be timeless, God’s grace and mercy come to us in real time, in the specific circumstances in which we happen to find ourselves. That was what the Prophet Baruch was explaining to the people in the sad and troubled time that followed the Temple’s destruction and Israel’s exile to Babylon [Baruch 5:1-9]. Baruch invited the people to put aside their mourning and contemplate the exiles’ return at the time of the fall festival when the autumn rains bring new life to the parched land. He portrayed the return of the exiles as if they were on a pilgrimage, a pilgrimage brought about by God alone, who is revealed in his mercy and justice. Some 25 centuries later, we read and hear this prophecy in a world which once again is witness to a seemingly endless procession of exiles – refugees from Syria and other places where war and chaos currently destroy lives and families and the very fabric of society itself. Unlike in Baruch’s prophecy, the exiles don’t all end up in the same place. But wherever they come from and wherever they go, our obligation, as the United States’ Bishops at their November meeting have just recently reminded us is “to care for and stand with newcomers, authorized and unauthorized, including unaccompanied immigrant children, refugees and asylum-seekers, those unnecessarily detained, and victims of human trafficking” [Faithful Citizenship, 81] . And that is why God’s gift of grace and message of mercy are so central to our experience here and now, which is why Pope Francis has challenged the Church to take a pause from business as usual and go on pilgrimage, like Baruch’s exiles, through the Holy Door of Mercy in this Extraordinary Jubilee, this Holy Year of Mercy, which will begin in just two more days. For most of us, preoccupied as we inevitably are with our narrow here-and-now concerns, this Holy Year of Mercy reminds us what Advent and Christmas are actually all about - God's active movement of grace and mercy into our world. Isaiah prophesied that all flesh shall see the salvation of God, but John wants us to recognize how that future is already happening here and now in the present. And, as in Isaiah's day and as in John's, there are certainly plenty of valleys to be filled and mountains and hills to be leveled by God’s grace and mercy in our world.